This heated carpet cleaning machine is actually our most versatile heated extractors that we have to offer. It can be used with or without the external heater, depending on your extenuating circumstances. For instance if you are cleaning carpet in an institution, or an older home, to run the heated option, you will need 2 separate outlets on separate circuits that provide 15 amps of power each. If you find that you are blowing breakers, you can remove the heater, as use it as a non-heated extractor, just like our cold water carpet cleaning machines. We provide a circuit tester so you can make sure you are operating on 2 separate circuits before you begin cleaning. No one likes to start cleaning, and then blow a breaker in the middle of your job. Please take a look at our movie below, for an introduction to this heated carpet cleaner. This heated machine comes with 100 PSI pump, and a dual 2-stage vacuum motor system, that provides 150 inches of water lift. Both of these features allow you, the user, to clean 99.9% of all residential and commercial carpets. 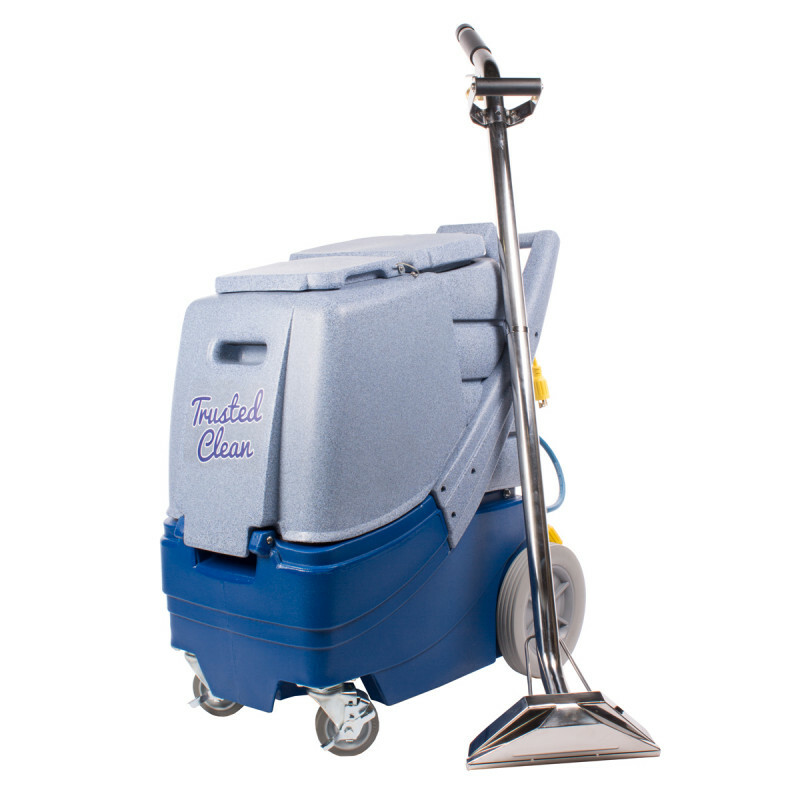 We recommend taking a look at our commercial carpet cleaning equipment package if you are interested in this machine. This package includes this exact machine, plus an air mover, a case of carpet cleaning chemicals, and a FREE stainless steel stair tool. We also have the handy Trusted Clean Comparison Chart to help you decide which Trusted Clean machine is right for you. Two 50' detachable twist lock power cords ensure you don't unplug your cords from the machine. Standard 5-gallon bucket fits under drain valve for easy disposal of dirty water. Opens quickly like a clamshell for easy maintenance and servicing. Water sealed top mounted switches make it easy for the user to operate the machine. External heater allows you to use this carpet cleaning machine in any environment. Lifetime warranty on the extractor tanks, 2 years on parts & labor on the extractor, and 2 year parts warranty on the heater (excluding wear items). This trusted Clean heated carpet extractor is also included in one of our carpet extractor package deals, called the Trusted Clean heated commercial carpet cleaning package. So if you were intending to buy some carpet cleaning chemicals, an upholstery tool, and an air mover... why not just buy the whole package and save yourself a bundle?